We started at my old stomping ground, the Adelaide Hills - the final destination Mildura, back in Victoria in the centre of the Riverlands. How we got there... was up to me. I was excited by the prospect and had decided on winding back through Strathalbyn, where I went to high school and then further into the hills before heading up to Mt Lofty. I remember from my early childhood going up and down the steepest of all dippers in the world called Tregarthen Road with my mum in a V8 Ford, and I couldn't wait to take everyone along that road. Sadly as is the way, I grew up and those massive dippers seemed more like a couple of bumps in the road. Maybe the sensation was more sensational in a cage? The ride up to Mt Lofty is beautiful though, it's a real highlight of the Adelaide Hills so we cut around the back of Ashton and past all the apple orchards before heading up to the summit. Sadly some of us didn't catch the 'master plan' though and missed the turn off to Mt Lofty, then once up there the group broke up looking for one another, and before you knew it the majority were down in the city scratching heads as to what had happened to the 'lost few'. Somewhere amongst that kerfuffle time got away from us and it was decided that we better get going and slab it out on the highway for Mildura so we could jump in the pool. There was nothing else to do, the group had been split up and it was the night's destination, 400kms away. It was now 40 degrees Celsius and just the ride through the city forewarned of overheating problems, dehydration and imminent heat exhaustion. We made a heat counter plan; every 100kms we'd all stop and take in water, cool down and then get going again. 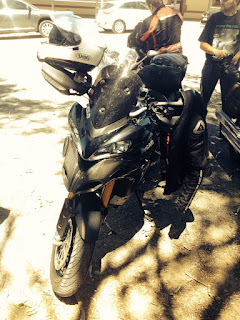 It was probably the longest five hours in the existence of all motorcyclist adventures (yes I'm a drama-queen). I remember passing through Renmark at the halfway mark and reading a billboard that said 44 degrees. Delirious I cackled wildly into my helmet, totally demented. Then something happened though. I adjusted to the heat, I adopted new techniques (thanks Steve for the wet t-shirt tip) and I buckled down and got on with the job. Sitting on the speed limit (thankfully out in SA it’s 110km p/hr) cruising in and out of the pack to break monotony, we were able to barrel down the Sturt Highway, kilometre after kilometre. The Ducati never skipped a beat. I found new love for my massive machine. 4th gear is perfect for roll ons from 60km towns back up to the 110km limit and the sensation is fantastic. Torque pulls you back in your chair as you roar up to that limit, then kick it up two gears to sit nicely on 4k rpm and cruise. It also lifts the front wheel in first under gradual acceleration in Sport Mode quite easily. It's an awesome confidence inspiring machine and how it managed to keep its cool and deliver me safely at the end of every day, I have no idea. Technology, such wow. It also has just the right amount of electronic wizardry to keep a bored highway rider entertained. I pulled an average of 109 km phr for 5 hrs and got 4.2L to the 100kms travelled. I can easily do 300km on one tank and if things get tight I pop it down to Urban mode cutting power to 100 ponies and saving fuel I can do 350kms on a tank at this pace. I adjusted each trip-meter to watch current-tank mileage on A and overall mileage on B, faffed about with the seat height by adjusting the Pillion and Luggage selections and found some perfect settings that I'm really happy with. Not a fan of luggage I managed with a single Kriega US-20 tailpack strapped to the rear luggage rack no sweat for 4 days. My only complaint about that is nowhere to store several bottles of water, which is where a single pannier (top box maybe) for longer tours would be better. It sounds beautiful humming at this speed too, just ticking over at 4k rpm, being pinned to the tank slipstreamed the heat up and over my head. Just a gentle hum of valves and pistons working harmoniously to carry me through this sanctimonious heat to my destination, that sweet sound kept me company the whole way, making my heart sing in unison (or delirium potentially). There was no other bike I would have rather been on at that point and I think others may have even leered amorously at me occasionally. At one point, a lady pointed at my bike in a car park and said ‘I like that one, it looks like the Bat Bike’ un-prompted, in front of everyone, and my life was complete. Bat Bike MFW! Thank the mighty lord baby cheeses for Sargent Seats too. I could never have done it without you. Whatever magic pixie dust you put into that foam on your seats, it’s an utter miracle. I never once had CAF (Chronic Arse Fatigue) that plagued every single one of my fellow riders. It's like riding a marshmallow unicorn and I never want to ride a bike long distance without one again. And another shout out has to be given to Shoei for the 'Best Touring Helmet' award for the mighty GT-Air. This is easily the best helmet on the market for long distance touring. The airflow is just incredible. Even in this heat, I managed to keep a relatively cool head when most were on fire, like that guy in that movie, I also put this down to my decision (finally) to try a white helmet. The GT Air has the most brilliant design white helmet IMHO, a honeycomb pearl finish with a black racing stripe straight down the guts. The quietest lid I have ever owned too. By miles. I have more to say about this helmet soon in my full long-term review, stay tuned for that (or just go buy one now, you won't regret it). 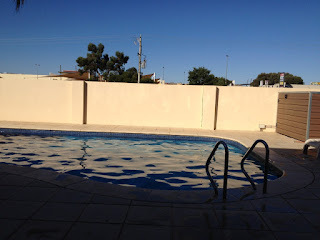 So it was after about 5 hours of this type of torture that we pulled into the Mildura Plaza Motor Inn on Calder Highway and within minutes I was in the pool. It was so nice but also had the adverse effect something akin to an ice headache. I guess when you have been roasted like a potato chip for 5 hours then jump into cool water it's lucky I didn't explode like cheap crockery. I had never been so happy to see a Pool before. One day to go, a survivor and a new level of respect for the road as well as my ability to endure heat for that long, I was pretty relieved to retire for the evening in front of a re-run of Iron Man 2 on the box. Job done. Home stretch tomorrow, should be straightforward and we have planned an early start to beat yet another 40 degree day.